These are all the Blogs posted in April, 2015. 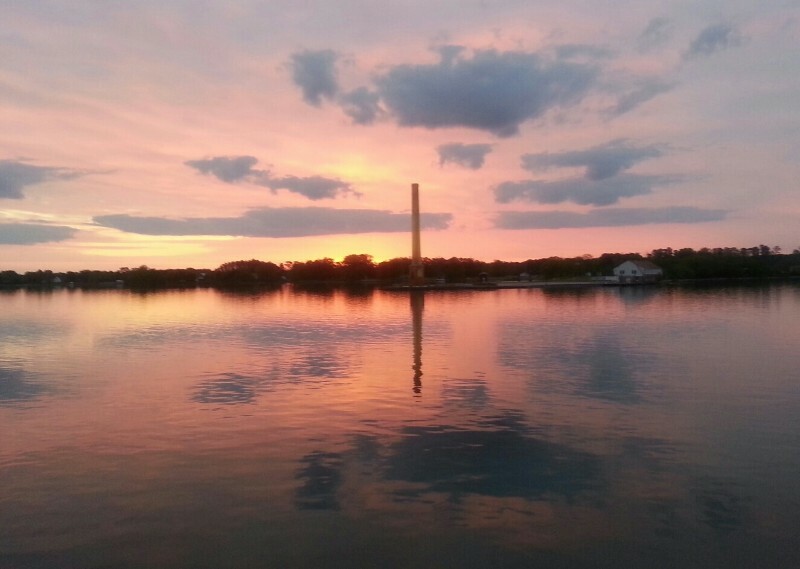 We departed from Reedville this morning at 0610 with a beautiful sunrise before us as we exited Cockrell Creek and the Great Wicomico River toward the Chesapeake Bay. The forecast was for some nasty weather coming in late tonight and a bad forecast for all day Friday. We wanted to get as far up the bay as we could today and be in a protected area tonight for the approaching weather. 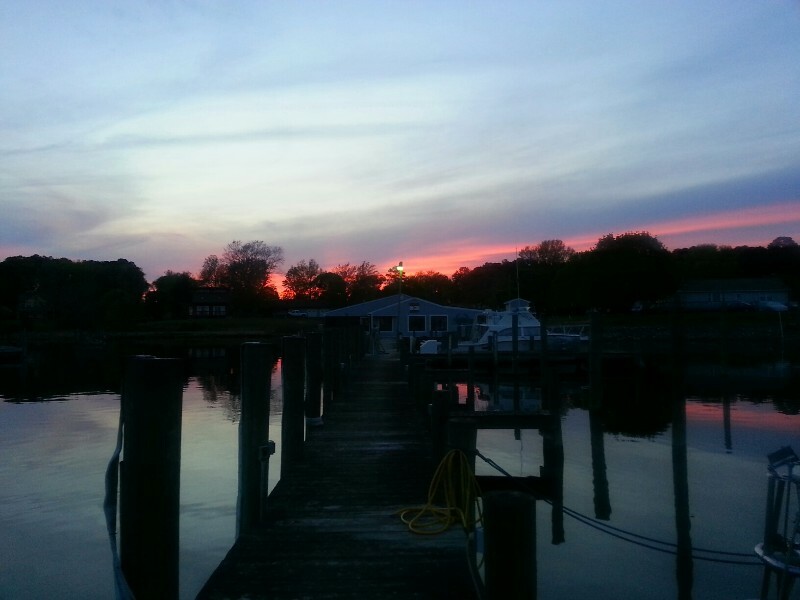 Normally on this day we would travel to Galesville, MD off the West River on the western shore of the bay. They have a small town dock that is just big enough for us to dock. There is no power or water and it’s a little chilly outside at night now dropping into the 40’s so heat all night long is nice. Otherwise we run the generator for the evening while we still up… but once we go to bed the generator is shut down and no heat for the rest of the night. Exploring the options to us for overnight locations we decided to continue on to what would have been our destination for Friday night… Chesapeake City, MD on the C&D Canal. There is a nice town dock there and dockage is free only charging for power or water. $15 for electric… $10 for water. It’s totally protected from any weather and compared to Galesville it’s a luxury resort. Susan loves browsing through all the little chops adjacent to the docks. So, it was a plan! Not going to Galesville moved our course from the western shore of bay to the eastern shore so the scenery was new to us… not that you can see a lot as you are still a few miles off the shore but it made a difference at the Chesapeake Bay Bridge as we were going under it in the eastern channel and a whole different looking bridge than the suspension portion of the bridge spanning western ship channel. It also meant a lot more fishermen out pulling their toy boats behind them. At least that is what they look like… trolling rigs of some sort that spread out each side of their boat 150 feet at least and they just do not get the idea that a large boat is heading straight at them and they should try to avoid them rather than zigzag across in front of them. They sure get mad when you run right over the “toy boat” they are dragging behind them. JUST KIDDING! We did not run over any but if you even get close they get real upset and start making these strange gestures with their arms. Just hard for me to understand… we are on a straight course down a marked channel and they are crossing my bow and get upset at me…. Hmmmm. Just after the bay bridge the weather started to deteriorate. Winds picked up to a steady 20 knots with gusts close to 30 knots and rain. Thunderstorms! Luckily we seemed to in between the bad bands of weather and only catching the winds with just intermittent rain, but it did kick the waves up from what had been a flat clam day. NE winds right on the bow and 2-3 choppy waves that make more noise than anything else. About 3 hours to Chesapeake City at this point with a slight boost in current pushing just over 7 knots but it changed to against us before we arrived. One hour ETA with 7 miles to go and we started losing our boost of current. The hour turned into an hour and half Before we arrived we had slowed to a snails pace at 4.4 knots with over 2 knots of current on our nose. 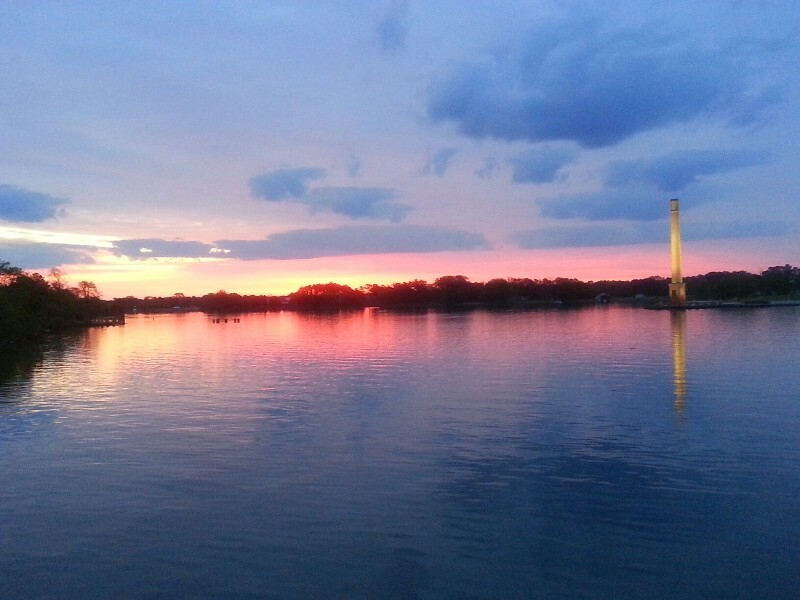 We arrived to Chesapeake City at 2345 and turned the corner into the basin where the docks are and there was not a single boat on the docks… YEAH! We had been worried that we traveled so long only to find the docks full and we did not have a backup plan. BUT, they were empty. We approached the dock and I instructed Susan that we would go to mid dock to be further in from the C&D Canal boat traffic that can cause some wake at times even though it’s a no wake zone. We got close to dock and discovered that reason no boats were on the docks. The docks were closed… under repair with no decking just the framework on top of the floats. NO! There had been no notices of this in any of the sources we use while we cruise. Plan 2… NOPE, we had not made a backup plan. I moved to the marina adjacent to town docks at the Chesapeake Inn and the 7.5 foot depth at the town dock started dropping fast… 7, 6, 5.8, 5.6. 5.4, 5.2…. LAST LAST LAST started flashing on the screen.. meaning less than 5 feet deep… it was close to between mid and high tide so we were not docking here with a 3.5 tide rise and fall. We would sitting in the mud. OK… only other option was across the canal at Schaefer’s Canal House Marina. Docking there was interesting as we had the 2 knot plus current to deal with but we did well… we did not damage the dock or SAILS… At 0010 we were securely docked with power on at Schaefer’s Canal House Marina. Our position at the marina N39°31.79', W075°48.789'. We traveled today for 18 hours covering 122.2 nautical miles averaging 6.8 knots. The night was a little noisy with car traffic… docked right under the Chesapeake City Bridge and the $15 for dockage went to over $100 for dockage but we were safe and sound for the night and it’s a good place to be able to rendezvous with our friends Jim and Cathy Fisher who were so kind as to receive our forwarded mail for us. Beecha’s meds were coming in the mail and we are out of them as of today so the timing was perfect. Jim and Cathy are coming for lunch. 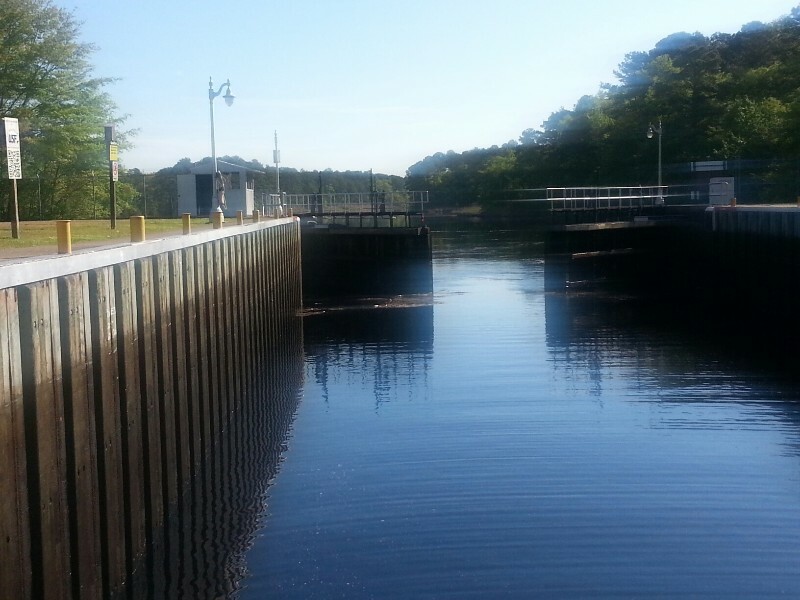 No southbound Dismal Swamp traffic so we were able to get through the Deep Creek Bridge at 0830 and we were exiting the Deep Creek Lock at 0900. We were going to stop in Portsmouth at Ocean Marine and utilize our FREE dockage from last years misunderstanding with them but the forecast for the Chesapeake Bay today was for 5 knot winds and less than 1 foot waves. The forecast for Thursday was also good with 5-10 knot winds and 1-2 waves. That’s two days of smooth cruising in a body of water than can be really nasty. The forecast for Friday is not that great but we will be almost to the top of the bay by then and can do handle that area with a bad forecast. 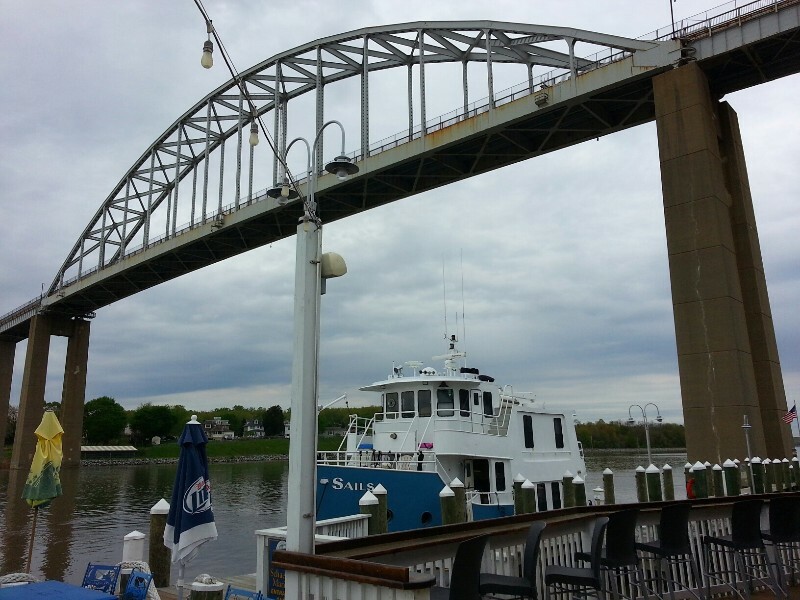 This puts us in Chesapeake City on the C & D Canal on Friday. With all of this in mind we decided to continue up the bay and get to Reedville tonight. The forecast was exactly as it stated… the bay was flat calm all day long. Very little other boat traffic. Current with us out of Norfolk and against us until just after Wolf Trap Light where we started to get a little boost the rest of the way to Reedville, VA.
Our position tonight is N37°49.948’, W076°17.129’. We traveled today for 11 hours covering 72.2 nautical miles averaging 6.6 knots. We departed from Alligator River Marina this morning at 0700 and headed out to the ICW. Today we had to cross Albemarle Sound and the winds were kicking were reading at 20 knots plus with gusts to over 25 knots out of the NNW. Exiting the mouth of the Alligator River the seas were 1-2 feet. Soon as we cleared the bars at the mouth of the River we started getting steady 3-4 footers with some bigger rogue waves. It was NASTY! 3) go beam across the Albemarle to the North River and the Virginia Cut and Currituck sound. We opted for option 2 and the smoother ride across the Albemarle. It would also be shorter time in the heavier seas compared to option 3. Option 3 also had Currituck Sound in the route. It can be nasty with winds like we had today. 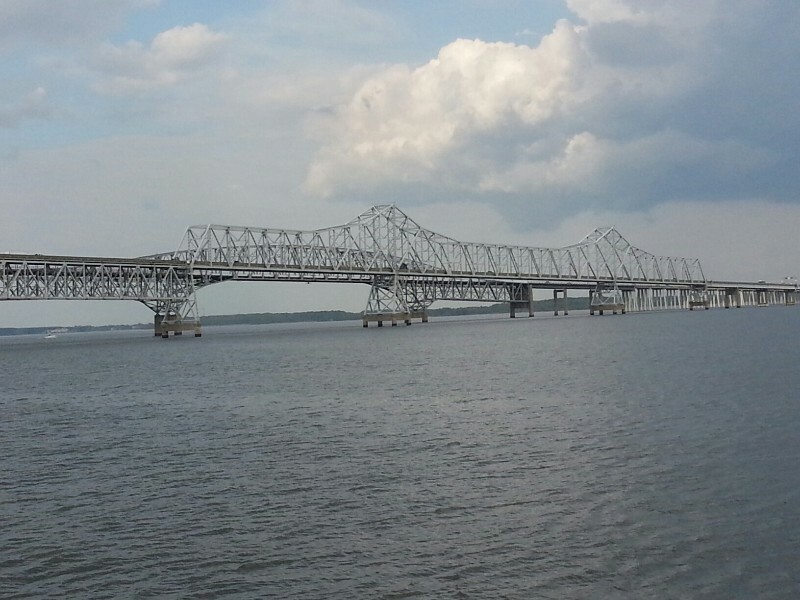 We were soon across the Albemarle and heading up the Pasquotank River toward Elizabeth City. This route would have doing the Dismal Swamp Canal. Really don’t care for it as we can’t make much more than 4 knots for about 20 miles. We had two locks… well one today… The South Mills Lock and Bridge just north of the lock. The same man operates the lock and then drives to the bridge to open it for you. 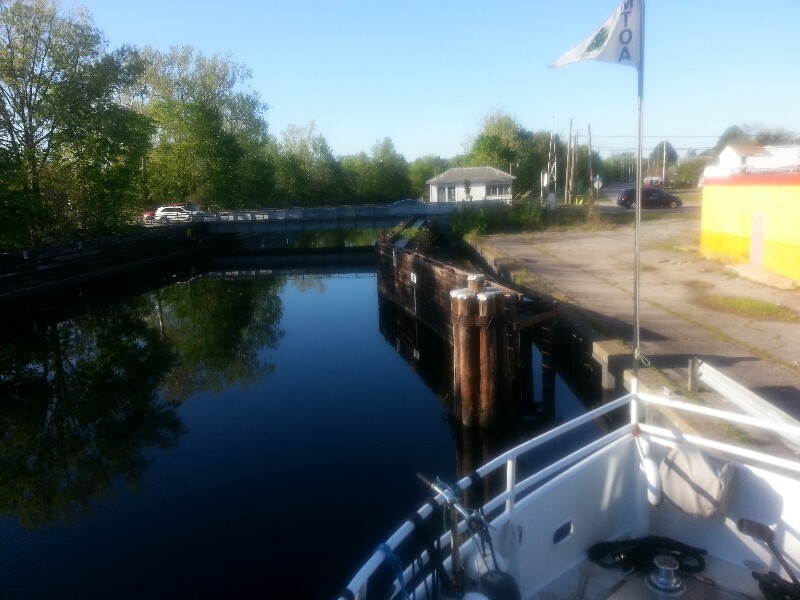 We reached it at it’s 1330 locking and the next lock 22 miles away has its last locking at 1530… 22 statue miles in two hours… would have to go much faster than SAILS is capable of and the entire canal is a NO WAKE ZONE. The other very disturbing thing abut the Dismal Swamp is the deadwood on the bottom… all the way through you are continually hearing these horrible sounding thuds on the hull. We have had issues with it damaging our props but today no damage just the horrible noises. Although it is very beautiful. We arrived to our destination for the night at 1755 alongside a bulkhead with just the right amount of room for us to dock. There used to be a Mexican restaurant here but it appears to have gone out of business. Susan came back from walking Beecha and spied a Hardees across the street and is now craving some fast food from Hardees for dinner. 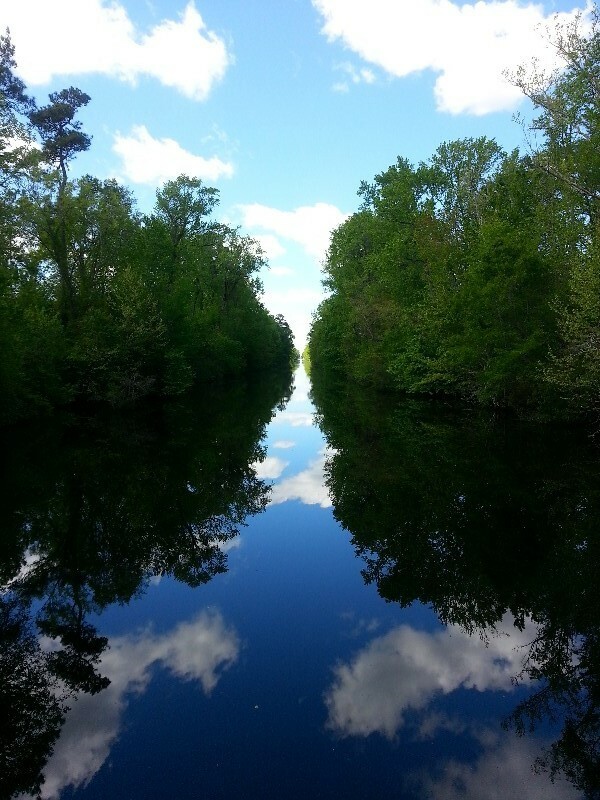 I wish we could have continued on to Portsmouth area but we are trapped in the Dismal Swamp Canal at Deep Creek. The last bridge and lock opening was at 1530 and we can’t even leave early as the first bridge and locking is at 0830. 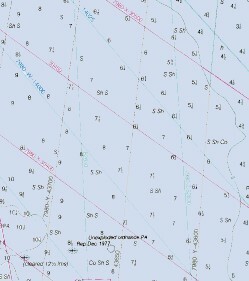 Our position tonight is N36°44.428’, W076°20.698’. We traveled today for 11 covering 64.5 nautical miles averaging 5.9 knots.